Giving unemployed people access to temporary work. Helping unemployed people through skills programmes and work experience. Ensuring that unemployed people receive an allowance for any work they have completed as part of the EPWP. Enhancing EPWP participants’ chances of finding jobs or starting their own businesses. The infrastructure sector is led by the Department of Transport and Public Works, together with the departments of Human Settlements, Health and Education, as well as municipalities. Work opportunities within this sector focus more on labour-related activities (for example maintenance programmes) and are likely to provide regular jobs to large numbers of people. The non-state sector is led by the Independent Development Trust (IDT) and includes the Department of Social Development and municipalities. IDT provides funding to NGOs, who then provide regular part-time work with regular incomes. This sector is led by the Department of Environmental Affairs and Development Planning, together with the departments of Agriculture, Cultural Affairs and Sport, and Tourism, as well as municipalities. This sector creates jobs through alien vegetation clearing projects, wetland rehabilitation programmes, waste management and community tourism projects. The social sector is led by the Department of Social Development, together with the departments of Community Safety, Education and Health, as well as municipalities. The sector focuses on increasing the quality of home-based care and early childhood development programmes, both of which require large amounts of dedication. Who Qualifies to Work on EPWP Projects? Unemployed and unskilled people aged 16 to 35 are eligible to apply. The conditions of employment for EPWP workers are set out in 2012’s Ministerial Determination. EPWP jobs are temporary or on a contract basis. Task-rated EPWP workers may not work more than 55 hours a week. Read more on normal work hours. 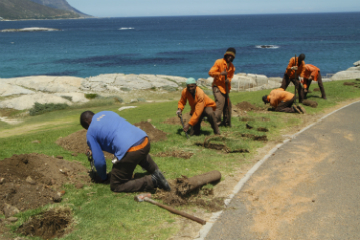 EPWP workers are entitled to a 12-hour daily rest period and must have two days off a week. Read more here. An EPWP worker can accumulate 12 sick leave days in a year. This may not be transferred from one contract to another. Workers who work for at least four days a week can get three days paid family responsibility leave each year. More leave conditions. Workers will only be paid at the end of each month for tasks that have been completed. More payment conditions. Employers must ensure the working environment is healthy and safe. A worker must use any personal protective equipment or clothing issued by the employer and work in a way that does not endanger his/her health and safety or that of any other person. More health and safety conditions. The certificate will reflect any training received by the worker as part of the EPWP and the work performed by the worker. Payment for meal breaks longer than 75 minutes. The National Youth Service is aimed at unemployed youth in the technical trade industry. Beneficiaries of the Contractor Development Programme include contractors with a Construction Industry Development Board (CIDB) Grading of 1-5.